This is my husband’s Grand Mother’s Recipe. I learned this from my mother in law. This is one of the authentic Konkani recipes in North Kerala side. For this we need Bimbul (Bimbul in Konkani, Bilimbi in English), Alwa mande (Chembu in Malayalam, Colocasia in English and in Hindi Arbi) and Bitter gourd. 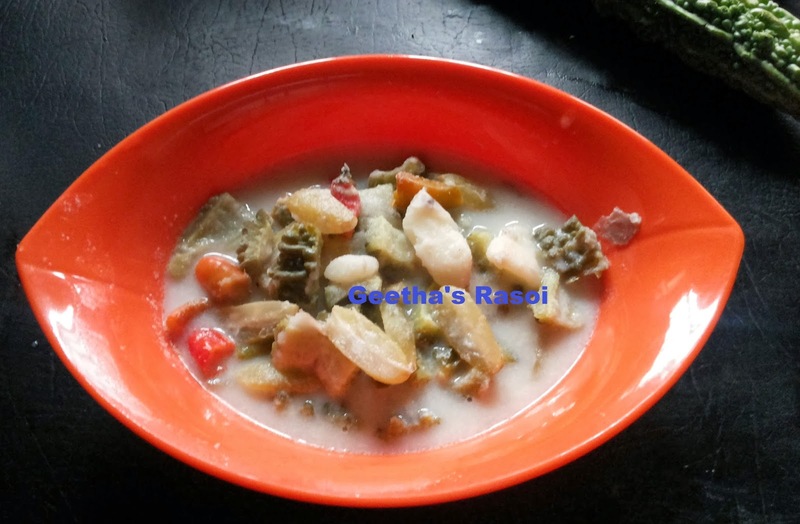 Its a combination of the sourness of Bimbul, sweetness of coconut milk and the bitterness of karela. Its a very good side dish. This is not too spicy curry. Peel of the outer skin of Alwa Mande and chop into cubes, chop kaipakka in to cubes, slit green chilly and Bimbul. Add little water and salt and pressure cook for 1 or 2 whistles. Grind coconut into fine paste, add boiled vegetables, add hing powder and then boil it for 5 minutes, switch off the gas and pour 1 tsp of coconut oil. Goona is ready to serve.